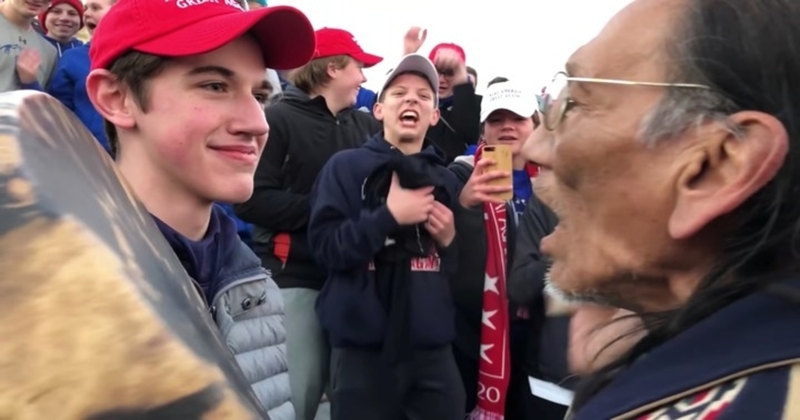 Media organizations across the aisle came under fire this week for depicting students from Covington Catholic High School as racist after a viral video showed them engaged in confrontation with tribal elder Nathan Phillips at the Indigenous Peoples March. The full video provided further context, such as the antagonizing presence of the Black Hebrew Israelites nearby, and several of the reports were heavily updated when the new information came to light. Many have criticized the mainstream media for rushing to condemn the students and have accused journalists of exhibiting bias against the teenagers, who were at the March for Life and were wearing Make America Great Again hats. Others have defended claims that the students behaved in a racist manner. From the Blog: The Covington Catholic story shows the media is biased toward outrage. Check out some other big stories this week: Senate Rejects Competing Proposals to Open Government, New York Passes Law Expanding Abortion Rights, and Understanding Racial Inequality. "Over the weekend, longer cellphone footage emerged showing that preceding the incident with the Native American activists, a group of four Black Hebrew Israelites were arguing with the Covington students. Nathan Phillips is seen moving between the two groups. He said later he was trying to diffuse the situation." "The footage, which went viral, led to widespread criticism of the boys. However, additional video footage has provided further details of the incident, while student Nick Sandmann has denied mocking Mr Phillips." "Bias in media is a powerful business model, one that hinges on appealing to a consumer's raw emotions to ensure that he or she comes back for more. That often manifests as blatant partisanship, where writers and commentators stand to gain from stoking anger at "the other side." A photo, quote, or sound bite without the proper context can prove useful in meeting that bottom line. Outrage sells." "In context, it appears that what really happened on the steps of the Lincoln Memorial is that a group of Catholic school boys was targeted and harassed by grown adults just because they were white, Catholic Trump supporters." "Occasionally, we’ll get something hastily and spectacularly wrong... In this business, all we can do is own up to mistakes when they happen. We apologize to our readers and especially to the Covington students, who didn’t need us piling on." "Yet the instant a single video of this incident hit Twitter, journalists jumped to uncritically accept Phillips’ account of how a mob of MAGA-hat-wearing white teens surrounded and taunted him. After all, the image exploited reporters’ preconceptions: Here was an aged Native American surrounded by a pack of smirking pro-Trump teens." "Most important, it’s true that context demands more than watching a single event from all possible angles. It also means understanding the world where the event happened. Anyone who wears a Make America Great Again hat knows what it stands for, and who it stands against. Anyone with an understanding of American history knows that white people have long made excuses for other white people’s racist behavior — protecting their own as a method of protecting themselves." "Next time a story like this surfaces, I’ll try to sit it out until more facts have emerged. I’ll remind myself that the truth is sometimes unknowable, and I’ll stick to discussing the news with people I know in real life, instead of with strangers whom I’ve never met." "But, as the days have passed, it seems that as soon as the story becomes more complicated – when a fuller picture emerges in all of its messy human detail – the Indigenous are no longer deserving of compassion. If it was Phillips who approached the Covington students, commentators suggest, then maybe the cacophony of laughter, war whoops, tomahawk chops and that smug grin was not what we saw: racism." Discover more on this topic on AllSides. Mueller Report: Trump Implicated or Vindicated? Julian Assange Arrested in London: Justice or a Violation of the Free Press? Story of the Week: Joe Biden's Behavior Towards Women: A #MeToo Moment or Blown Out of Proportion? Story of the Week: Did the Media Blow It on the Mueller Report?